She's a long way from The Annex these days. The Duchess of Sussex during her visit to Dublin, Ireland. The Duchess of Sussex might have gained a new level of fame since officially becoming part of the Royal Family, but that doesn't mean she's forgotten where she came from. During her first international trip to Dublin, Ireland with her new husband, Prince Harry, Duchess Meghan admitted to royal fans: "I miss Toronto! It's a great place." The exchange happened while Markle and Harry were on a walkabout at Trinity College on Wednesday. While greeting the public, one fan told the duchess that she was from Toronto but was on holiday in Ireland. Recalling her conversation with the royal to Hello magazine, Canadian fan Fiona Moore explained, "I'm a fan of 'Suits' and I said to [Meghan] that I miss it." In response, Markle said, "So do I," according to the fan. The Duke and Duchess of Sussex on a walkabout at Trinity College during their visit to Dublin, Ireland. The former actress moved from L.A. — where she was born and raised — to Toronto in 2011 to film the TV series "Suits," which she starred in for seven seasons. During her time in Ontario's capital, she rented a two-storey house (which has since been sold for hundreds of thousands over asking price) and adopted a rescue beagle named Guy. It was thanks to this big move that the duchess also met her Canadian BFF, stylist Jessica Mulroney, who ended up playing a crucial role in Meghan and Harry's relationship. Jessica and her famous talk-show host husband, Ben Mulroney, used to host secret dinners for the pair whenever Harry visited Toronto. Jessica Mulroney and Meghan Markle attend a World Vision event in Toronto on March 22, 2016. And to top things off, Toronto is also where the Duke and Duchess of Sussex made their public debut as a couple at the 2017 Invictus Games. Meghan Markle and Prince Harry at the 2017 Invictus Games in Toronto on Sept. 25, 2017. 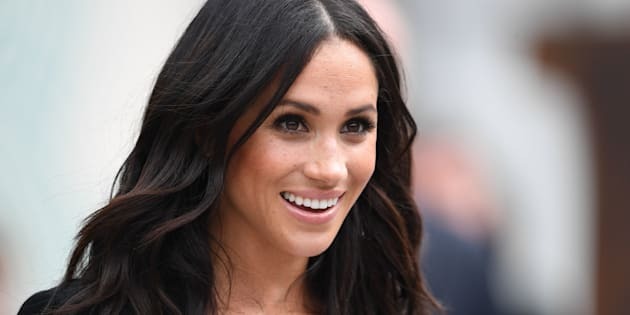 The Canadian city certainly holds a lot of fond memories for Markle, and the former "Suits" star has never been shy about making her love of Canadian culture known. Before the couple's relationship was confirmed last year, the duchess was spotted wearing a Toronto Blue Jays hat while out in London. And since being in the royal limelight, Markle has been a champion of Canadian fashion, wearing everything from luxury outerwear brand Sentaler to affordable pieces by Aritzia. We really can't blame Markle for missing Toronto! CORRECTION - July 12, 2018 - An earlier version of this story misidentified Jessica Mulroney's husband as Brian Mulroney. Her husband's name is Ben.